Today – April 24th – is the day Americans as a whole have worked long enough to pay off their tax bill for the year. In 2015, American’s will pay $4.85 trillion in taxes of all kinds to federal, state, and local governments. This amounts to 31 percent of the nation’s income in 2015 and 114 days into the year. Federal taxes account for $3.28 trillion of the tax bill, while state and local taxes are the remaining $1.57 trillion in taxes. Individual income taxes at the federal, state, and local level are the largest share of total taxes and take 43 days to pay. Payroll taxes take the second most days (26 days), followed by sales and excise taxes (15 days), corporate income taxes (12 days), and property taxes (11 days). The final 7 days are spend paying estate and inheritance taxes, customs, duties, and other taxes. 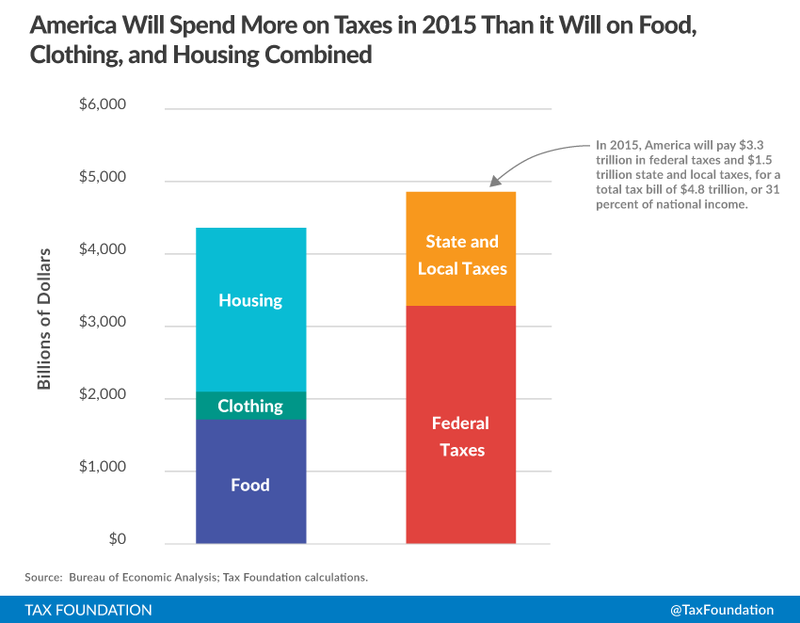 In total, America will pay more in taxes in 2015 than it will on food, clothing, and housing combined.